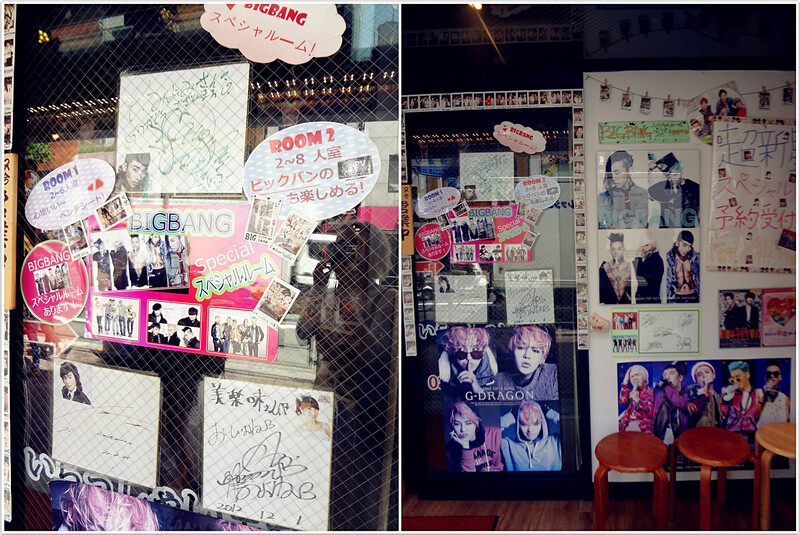 Miyomi 美楽味 — BIGBANG themed restaurant in Shin-Okubo! Another day, another food adventure! I don’t have any sort of real ranking of my favourite restaurants, but if I had one, this place would be sitting nicely on first place. I love everything about it. 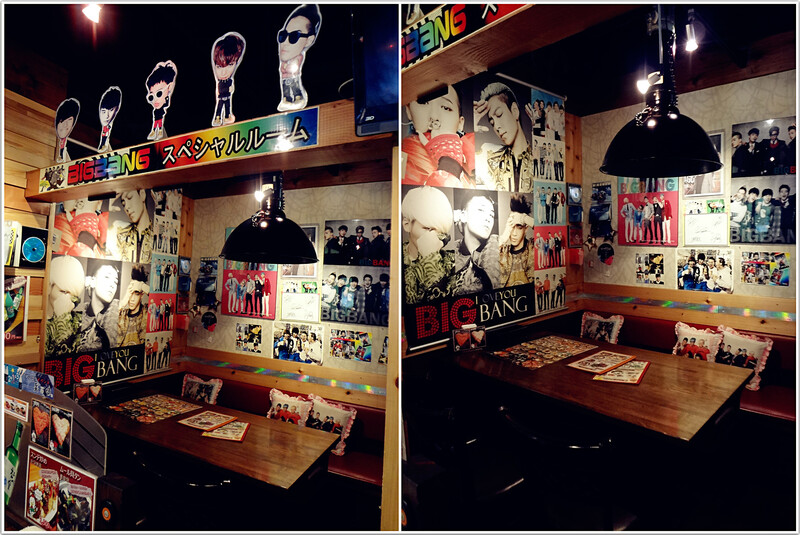 A BIGBANG themed restaurant in Shinokubo serving amazing Korean food. What else could you ask for? Not a big fan of BIGBANG? Absolutely no problem! You’ll find photos, posters and maybe even autographs of many other k-pop idols here too. Not a fan of k-pop at all? 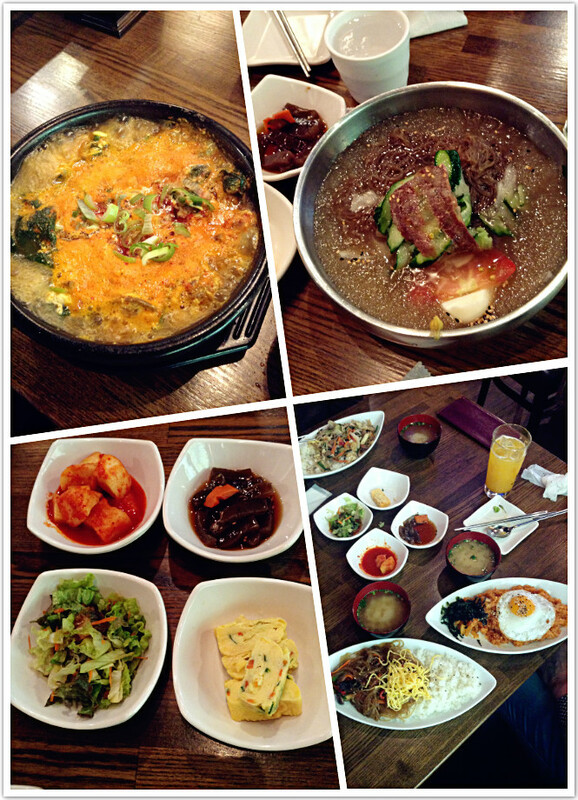 Enjoy the delicious and authentic Korean food they serve… and they have a pretty wide selection of amazing dishes! It’s just a 2 minutes walk from Shin-Okubo station. You can’t miss the gorgeous pink-haired G Dragon (I’m sure that this poster itself brings in a lot of customers…female customers). You can take a look at everything they offer even before you actually go inside. So as we can see (and as I mentioned before), there’s a special BIGBANG room — unfortunately I have never had a chance to sit there because it’s almost always occupied when I’m there. Apparently, Haruna Ai has visited the place and left them her autograph. 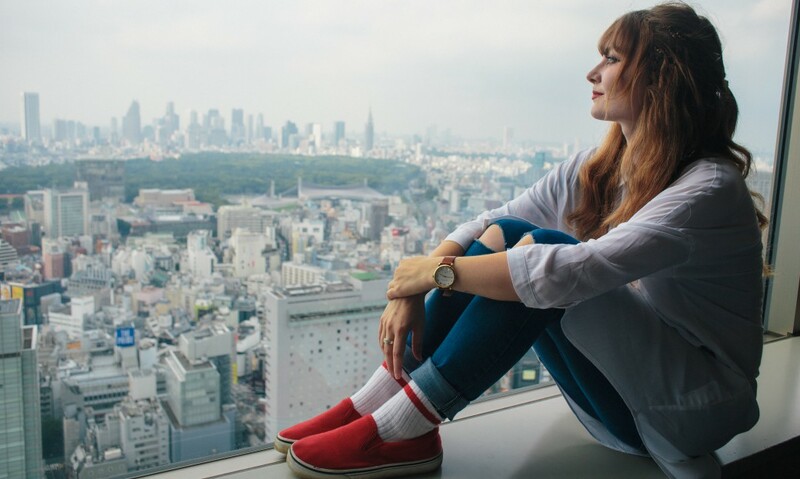 Who is Haruna Ai? When I first came to Japan, I saw her in lots of variety shows and thought she was a pretty cute lady with an interesting husky voice. Well, she turned out to be a ニューハーフ (‘new half‘) – a transgendered woman who won the “Miss International Queen 2009” held in Thailand (according to Wikipedia, she is the first Japanese to get that title). Well, I still think she’s a really lovely lady. There’s also a pic and a signature of a famous Korean actor Lee Min-ho, so I assume he’s been there too. Inside we have tons and tons of photos and posters of hallyu stars and BIGBANG of course. 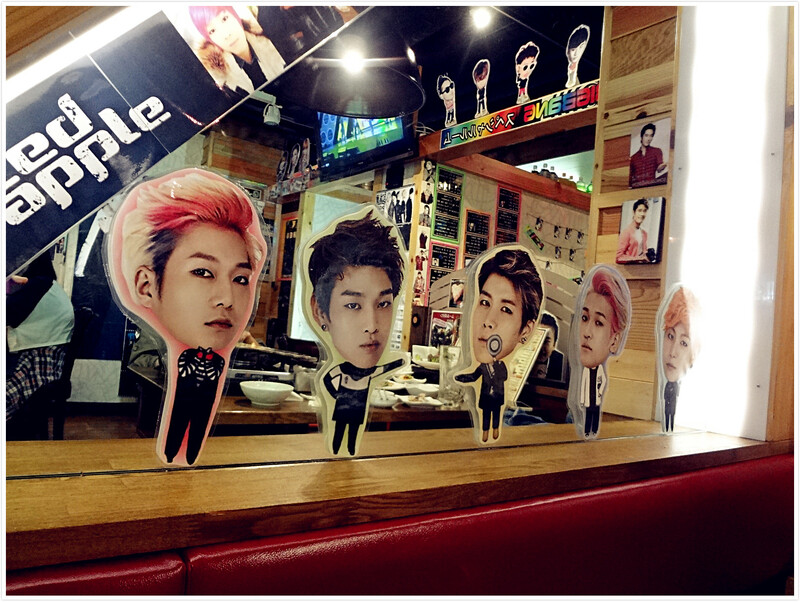 They play mainly BIGBANG’s music which is one of the reasons why this place is my favourite. Every so often they play music videos of other YG artists, but you won’t hear SM Entertainment or other agencies’ artists here. I should probably write about another restaurant in Shin-Okubo, where they play only SM Entertainment music for a change (and it was also much cheaper…). Someday I’ll be sure to get to that, so stay tuned. If you’re a big fan of k-pop, you might recognize these handsome young men. Unfortunately I couldn’t, so please let me know in a comment if you can identify them for me. Junsu: I guess I’ll go for a sour, too. 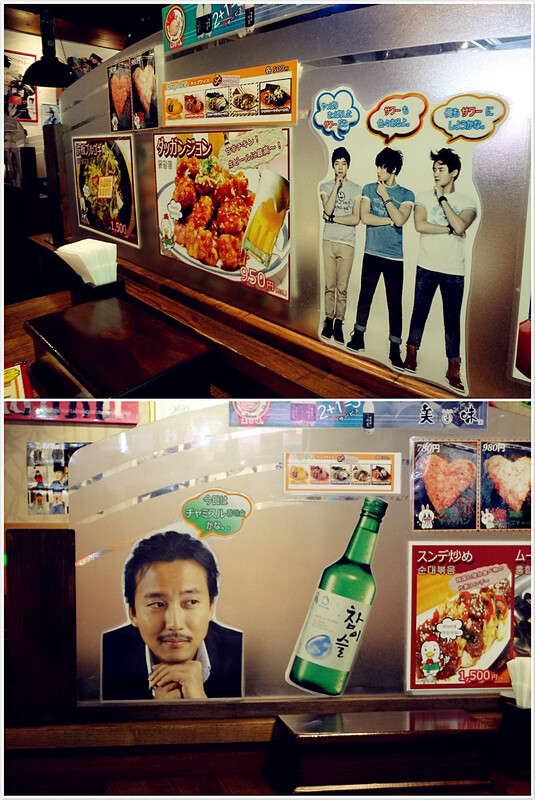 Kim Nam Gil is not as indecisive as JYJ boys and he knows that what he wants is chamisul (Korean vodka). 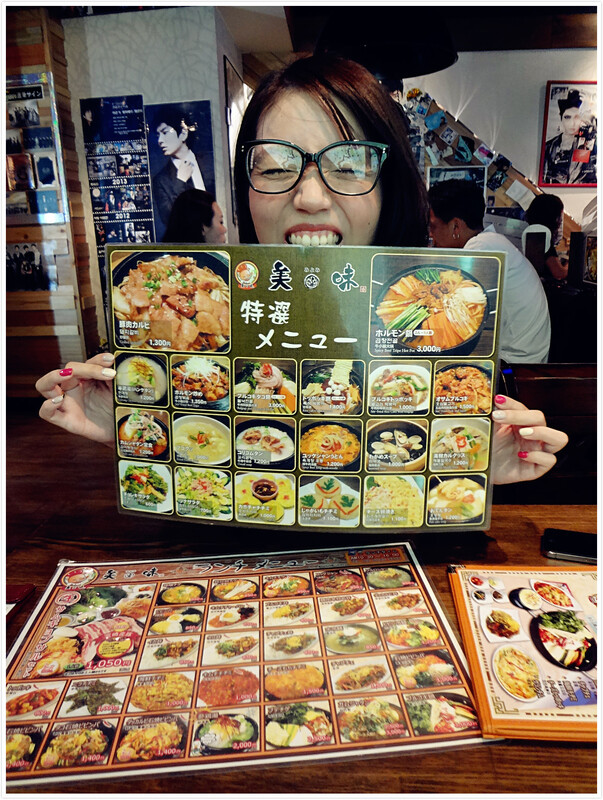 Big thanks to my friend Misato for posing in such a lovely way with their menu. You may think that their prices are a bit high, but keep in mind that dishes from this menu are supposed to be shared among 2-3 people. Here’s their lunch menu (10:30 – 16:00). Prices vary from 850 yen (which is super cheap) to even 3000 yen (which is not cheap at all). I have tried their japchae, their fried squid rice, kimchi jjigae, kimchi fried rice, bulgogi and probably some others but my absolute favourite is their cold noodles – naengmyon! Sooo good! Cheers! 乾杯! 건배! Bon appetit! いただきます! 잘 먹겠습니다! To make noodles easier to eat, waiters actually cut them. 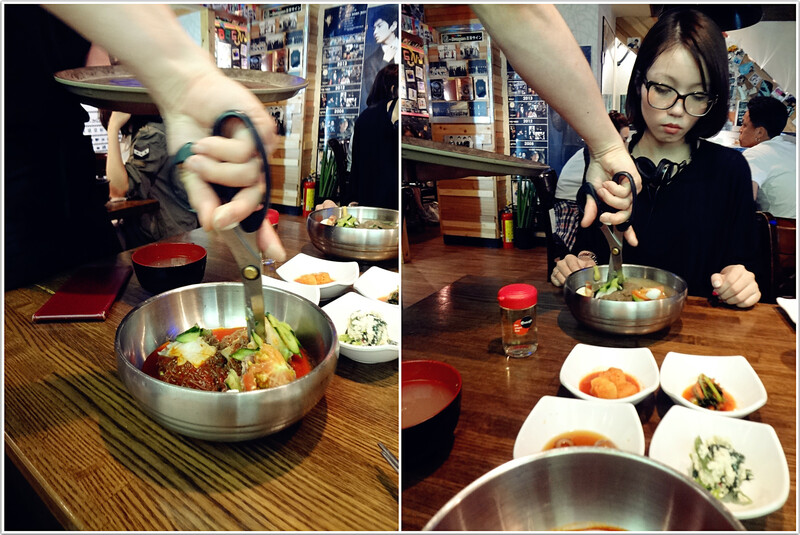 I distinctly remember the first time I ate Korean noodles, I was kind of surprised when I saw a waiter approaching with huge scissors and cutting my food. 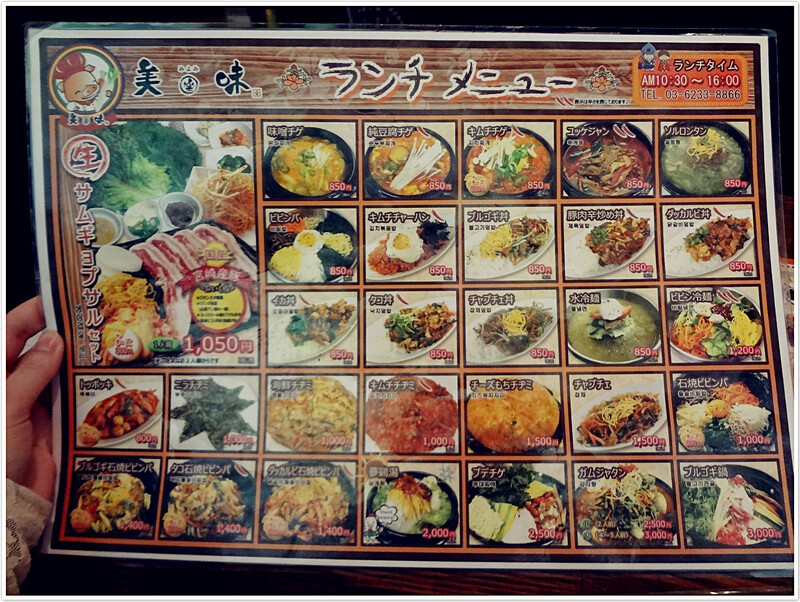 This has to be my favourite Korean food restaurant so far. I might be biased because of BIGBANG’s music and posters everywhere, but I would lie if I said I go there only because of them. I love the food, the drinks (awesome makgeolli cocktails!) and the neighbourhood. A great place for lunch – 10/10! Great post, as always! 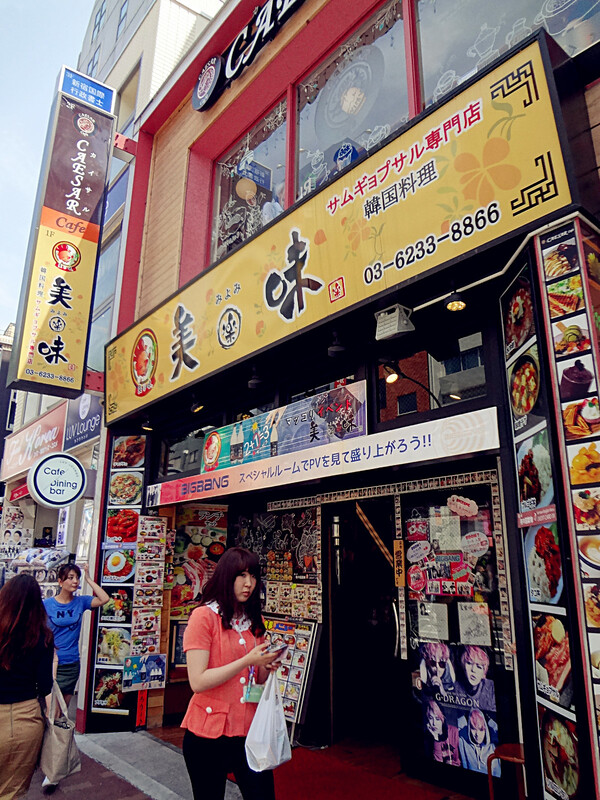 I’ve been to Shin-Okubo a few times, but I never noticed this – definitely need to go there next time! I’ve been here :D.I just sorta randomly picked it, as I was really hungry. 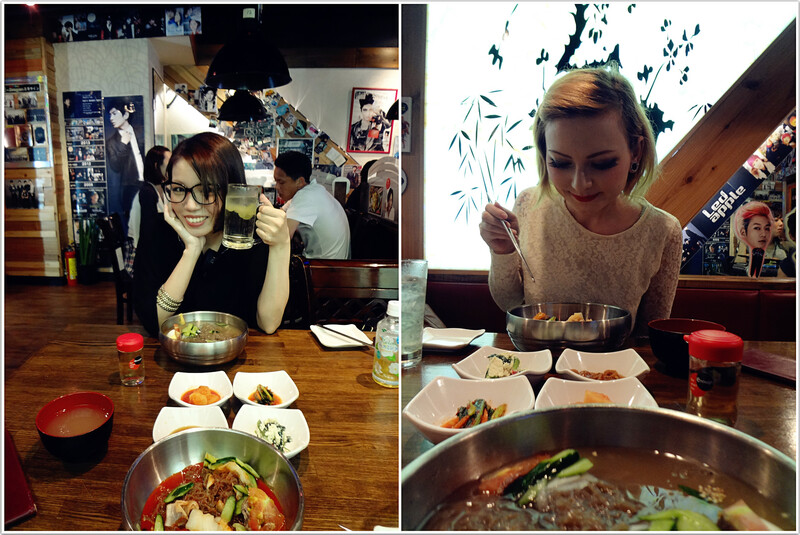 I’m not really a fan of k-pop, but the food is really good and it was an enjoyable experience :D. Great post, I love your friend’s boots! hii would like to ask if you see some store there that sells kpop goods, mostly YG artist related. Any store in Shin-Okubo sells YG related goods 🙂 When you get out the station be sure to turn right though!